Philippines has some of the best beaches in Southeast Asia, if not the world. As a tropical country with over 7,000 islands, Philippines is not only endowed with mountains, caves, waterfalls and a vast array of natural wonders but with the most beautiful beaches on the planet – from deserted white-sand beaches dotted with coconut trees to idyllic islands gifted with rich marine life. In fact, Philippines once again made it in Condé Nast Traveler's Best Island in World list for 2015 after Palawan topped the list, along with Boracay and Cebu. These world-class islands and beaches only prove that Philippines is, indeed, a veritable beach paradise. If you've been following me on Instagram and Facebook, you would see how crazy I am to visit and explore every beach in the country. In 2012, I made a list of my top Philippine beaches and since then more beaches have been added in my bucket list and crossed off one by one. Here are 45 of the best Philippines beaches I was able to personally experience which I recommend for you to see this 2016. It's so hard to rank them by personal favorite so I decided to list them down alphabetically by name. One of the popular beaches in the country is the charming Alona Beach in Panglao, Bohol. Aside from the famous Chocolate Hills and Philippine tarsiers which you can visit through Bohol countryside tour, Panglao is also home to some of the country's finest beaches. Click here to find the cheapest deals on accommodation in Panglao. Alubihod Beach in Nueva Valencia, Guimaras is a fantastic beach destination that's very accessible from Iloilo City. The beach is also the jump-off point for island hopping activity in Guimaras if you want to see more of what the island province has to offer. Ambulong Island is a pride of San Jose, Occidental Mindoro. Also situated in the island is a premier resort named Grace Island Resort which offers accommodation for travelers seeking for a relaxing trip or a romantic getaway. Their floating cottages look amazing. Apo Island is the biggest of the three islands located in Apo Reef Natural Park, a popular dive spot in Sablayan, Occidental Mindoro. It features the second largest contiguous coral reef in the world, next to the Great Barrier Reef in Australia. Truly world-class! Ave Maria Islet is a tiny island that features a beautiful sandbar surrounded by crystal clear water. It's one of the beach spots you can explore in the island hopping tour in Guimaras. One of the islands in San Jose, Occidental Mindoro is Ilin Island which features several untouched beaches and beach coves and these include Baclayan Beach. The beach is completely unspoiled, a perfect spot for anyone looking for a serene beach experience. Caramoan's beauty is unparalleled. No wonder it captivated the eyes of international visitors including the reality show Survivor which has been filming there for several years already. Bag-ing Beach is one of the many unspoiled beaches in this tropical paradise in Camarines Sur. You can visit it as part of the long trip island hopping tour. Off the main island of Panglao is a stunning diving and snorkeling spot in Bohol. Balicasag Island is famous for its amazing underwater scenery and marine life. The Balicasag Island Marine Sanctuary is a must-try for every visitor. If you're looking for affordable hotels in Bohol click here. Coron is not only known for its reputation as a great diving site but for its gorgeous beaches as well. Aside from Kayangan Lake that's one of the cleanest lakes in Asia, Banol Beach has definitely made me fall in love with Palawan. I recommend Patrik and Tezz Guesthouse for your budget accommodation in Coron or click here for more options. Bantayan Island is one of the country's popular and awesome beach destinations. I included it as one of the seven must-visit beaches in Cebu. The island offers a handful of activity and has a number of good resorts and hotels to choose from which you can find here. Puerto Galera is famous for its long white sand beach but there are hidden gems that people need to see. Unlike the crowded White Beach, other islands such as Bayanan Beach is a perfect alternative for anyone wanting peace and serenity. Probably one of the famous beaches in the world that put Philippines in the map as a beach capital. Having been to several beaches in the country, I can say that Boracay's powdery white sand is still unrivaled. Search for cheapest hotel deals in Boracay here and use this Boracay checklist for your next trip! Cagbalete is a remote island in Mauban, Quezon that's only a few hours away from Manila and great for overnight trip. The island is famous for the occurrence of low tide where water can recede up to one kilometer from the shore. I was fortunate to visit the island solo twice. You can find my Cagbalete travel guide here. I recently stayed at Dona Choleng Resort which I recommend. Cagbalinad Island is another stunning island in Caramoan with superb white-sand beach. The view of the Gota Island in front is marvelous. Click here for my separate blog post of Cagbalinad Island. Considered as one of the best kept secrets in Bicol is the beautiful Calaguas Group of Islands which is comprised of various islands and beaches. The Long Beach (or Mahabang Buhangin) is the most popular among tourists and is being compared to Boracay with less crowd and resorts. It's personally one of the best in terms of white fine sand and turquoise blue water! Cancuuay Beach in Oslob, Cebu became popular on Instagram. What I love about this beach is the picturesque view of rock formations and crystal clear water. Visitors of whale shark interaction and Tumalog Falls in Oslob can take a side trip to this magnificent beach. Ahh... El Nido. One of my top favorite beach destinations in the Philippines. Nothing compares to its alluring natural and exotic beauty from stunning beaches to beautiful lagoons. You can book for cheap El Nido hotels here. Daku Island is one of the three islands you can visit off the island of Siargao. The trip to Siargao, Surigao del Norte made me realized it's not only famous for surfing but for fantastic beaches as well. The first time I set foot in Guisi Beach I was instantly captivated by its splendid beauty. It doesn't have the finest sand but its crystal clear water is astonishing. Gumasa Beach is known as the home to Mindanao's biggest beach party where the annual Sarangani Bay Festival (Sarbay Fest) is being held. Beach lovers will definitely enjoy a visit to Guyam Island in Siargao. It's a little piece of paradise being the smallest among the three islands. There are no resorts in the island but it's great place to have a picnic lunch. If you plan on going island hopping in Puerto Galera, you may be taken to Haligi Beach as one of the stops. Like Bayanan Beach, this is also a good place for anyone who wants to escape the touristy White Beach for a moment. Literally hidden behind rock formations, Hidden Beach is simply heaven and is not to be missed when visiting El Nido. This beach is part of the Tour C island hopping tour. The beach that took me awhile to visit and the moment I got there, I was blown away by the postcard-perfect view! Kalanggaman Island features a superb sandbar that's so amazing it will take your breath away. Lahos Island is one of my favorite beach attractions in Caramoan. Its name was derived from the world "laho" (or vanish) since the beach disappears during high tide. You can visit this beach by going for the short trip island hopping tour. Malalison, or locally called Mararison, is a hook-shaped island found in Culasi, Antique. Aside from the beach and sandbar, you can take a short trek to the top of the hill for the scenic ocean view of its transparent blue waters. Aside from being a top diving destination, Malapascua Island is also famous for the azure-blue green water and ivory-colored sands of Bounty Beach. The beach resembles Boracay without the noise and night life. I love the island's tranquility and simple ambiance. Click here to search for affordable accommodation in Malapascua. Manlawi sandbar is perhaps the biggest sandbar I've seen. If you'd like to bask under the sun and get the perfect tan, don't miss out on this perfect spot! Out of the hundred islands in Hundred Islands National Park in Alaminos City, Marcos Island is among the best. Its emerald green water is refreshing and remarkable. Heaven on earth - that's how most people would describe Nacpan Twin Beach in El Nido, Palawan. The spectacular scenery of long white-sand beach, clear warm water and swaying coconut trees lining the shoreline is just amazing. My jaw dropped in amazement upon seeing the astoundingly beautiful water of Naked Island in Siargao. It's comparable to El Nido which means it's one of the best I've seen! If you're searching on where to stay in Siargao, click here for cheap deals. Pangulasian Island has a luxury resort but off the island is its pristine blue water that's perfect for swimming and snorkeling. Book your hotel in El Nido here. While enjoying the beaches in Philippines, there are times when you simply have to work. Having a Cloud based Windows desktop from CloudDesktopOnline.com and collaboration site from CloudAppsPortal.com can help you work from anywhere on your favorite device. Papaya Island is a small patch of land in Hundred Islands National Park. If you prefer less crowded and less commercialized beach in Alaminos, you can opt to drop by in this island. Patar Beach is considered a hidden gem in Bolinao, Pangasinan. The beach is adorned by golden white sand which makes it unique among the other beaches I've seen. It's a great place to head to for a quick weekend break from the metro. Pawikan or Turtle Island is known to be the sanctuary of sea turtles in Guimaras. It has a short but lovely beach with immaculately clean, warm water. Take a visit to this island by going for the island hoping tour. Pinagbuyutan Island is one of my top favorite islands in El Nido. The towering limestone walls and massive rock formations are simply breathtaking, apart from the pristine water and sugary white-sand beach. Click here for tips on how to travel cheap in El Nido. Quezon Island is one of the three most touristy islands in Hundred Islands National Park. Families and group of friends normally hang out in this island. There are a number of affordable resorts and hotels in Alaminos City if you plan to stay overnight. I was overwhelmed by the mystical beauty of Siquijor not because of its reputation for witchcraft and sorcery but because of its vibrant turquoise waters. Even though it's commercialized with the presence of a resort, its charm is still undeniable. Look for cheap rooms in Siquijor here. Seven Commando Beach boasts a magnificent span of superb white sand. The beach is part of the itinerary of island hopping Tour A.
Simizu (or Shimizu) Island was once a destination for fish feeding until it was stopped which I'm glad to hear about. It's one of the scenic islands in El Nido because of its incredible limestone formation aside from the fascinating underwater scenery. It's perhaps one of the best snorkeling spots in El Nido. Vigan Island features a sandbar that shapes like a snake, hence, the name Snake Island. Visitors can climb the peak of the hill for an awesome panoramic view of turquoise blue sea and nearby islands. Sumilon Island in Oslob is well-known for its shifting sandbar that changes shape and shifting location depending on the season. The crystal clear water surrounding the island is absolutely mesmerizing. It's actually a private island where the luxurious Bluewater Sumilon Island Resort is located. However, if you're looking for affordable resorts in Oslob, you can check out here. One of the things that impressed me with Southern Cebu is its amazing shoreline. Aside from the whale shark interaction, Tumalog Falls and Sumilon Island, Oslob also boasts of underrated beaches such as the one in Brgy. Tan-awan. In Panglao, you can explore the undisturbed Virgin Island and enjoy frolicking in its gorgeous sandbar. It's a C-shaped island, uninhabited and locals call it Puntod Island. White Island is one of the popular attractions one can experience in the "Island born of Fire". The white sandbar of Camiguin is great for beach bumming and this is where I first tasted live sea urchins that are peddled in a basket by vendors. These are some of the countless beaches I was lucky to explore in the country and there is definitely more in my bucket list. The endless beaches of the Philippines are just waiting to be experienced and discovered. 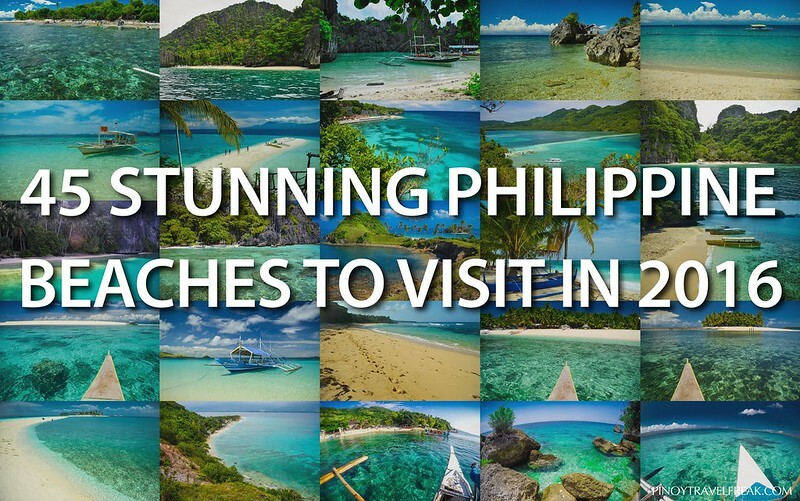 How many of these Philippine beaches have you been to? Share your thoughts in the comment section below!